The hills of Arezzo. this property is situated on the green hills which towers around the city of Arezzo that boasts really ancient origins and traditions and is worldwide known for its renowned goldsmith's art, for the historical re-enactment of the Saracen Joust, which twice a year brings the town back to the time of the wars against the Saracens armies and for the Antiques Fair which on every first Sunday of the month colors the medieval alleys of the historical centre. Its strategic position, at the convergence of the four valleys of Valdichiana, Valdarno, Valtiberina and Casentino, allows to easily reach the most beautiful places of central Italy. The farmhouse is set on the panoramic hill of Pomaio where you will find the nice Romanesque San Lorenzo church, dated back to XII century, and the remains of an ancient abbey founded in 1645, which today lodges a lovely restaurant where to eat typical Tuscan dishes. The panoramic and quiet position. this property is surrounded by olive groves and luxuriant woods with long and strengthening paths ideal for strolls towards the Alpe of Poti. 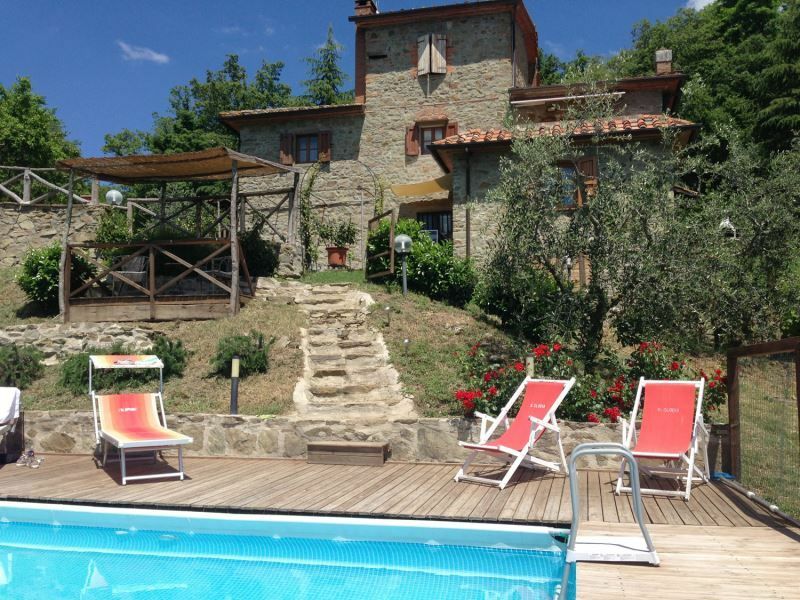 All around the house a wide garden equipped with gabezo and outdoor furniture to eat and relax in the quietness of the place while admiring the splendid view on Arezzo and the neighbouring valleys. In a sunny and panoramic natural terrace the beautiful, completely fenced pool (size 5x10 mt, depth 1,40 mt). This villa, in Muro, is a comfortable property sleeping 8 people. The villa offers superb accommodation, including modern luxuries such as internet access and a swimming pool.